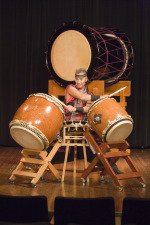 Share Kenny Endo Taiko's EPK! Taiko artist KENNY ENDO comes together with tabla master ABHIJIT BANERJEE and award-winning Latin percussionist JOHN SANTOS for a percussion summit that celebrates three of the world's most euduring drum traditions and creates three world premieres, composed by each of them, that interweave theirs styles and instrumentation. With the drum at center stage, the three take the most basic roots of music and rhythm that speaks to all cultures--we all have a heartbeat, after all--and creates sophisticated and complex percussion dynamics that will have the audience cheering. Unlike other percussion exchanges that often resemble jam sessions, this project creates three new and integrated works, each drawing from its roots but creating a synthesis that embraces them all, a metaphor for our global connections. "..he can always get a groove going."